Running safely should be high on your agenda but it is often something that we don't always think about. As a woman, I know that I am more cautious than my husband but in fact I think we should all take running safety seriously. Don't run on your own if possible. Having said that, I do like the solitude of a lonesome run but I usually tell someone which route I am taking and how long roughly I will be. Many people like to run with headphones, listening to music. This can be dangerous as you are then not aware of what is going on around you. If you must wear headphones, then only plug in one ear. Take your mobile with you in case you get into difficulty. This can be tricky though as mobiles are often too big to fit into your pocket especially when wearing summer gear. 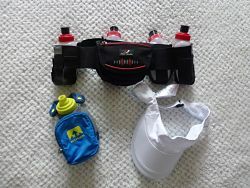 Consider a waist belt or arm band but choose a proper runner's one that doesn't rub or ride up or down. I often don't run with a mobile but instead I tuck a piece of paper into my pocket with my name and who to contact just in case. Running against the traffic is the safest. That way you and the driver can see each other and you both have more time to react if necessary. If you are on your own, avoid areas that are not familiar to your or areas that you feel uncomfortable in. Equally, don't always run the exact same route at the exact same time of day. You never know if there are creepy stalkers about. Although many dogs can be friendly or ignore you, some dogs will not be happy to see you. How to deal with an agressive dog. I've lost track of the number of runners or cyclists that I see on the road at night who are invisible until you are practically standing over them. 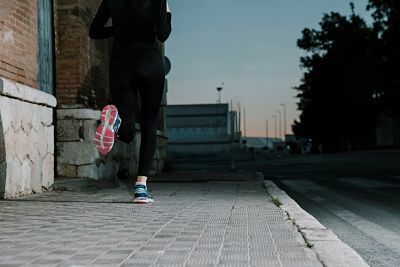 Often runners set off in the evening light and before they know it, it is dark and they are not prepared. I personally don't like running at night as my eyes don't seem to focus so well so I avoid it if I can. Basically you need to be seen and from a distance of oncoming vehicles so that they have plenty of time to slow down. To be seen, you need to be wearing the right gear (see next tip). Lots of running clothes are black (manufacturers could do better here) so you often blend into the surroundings. 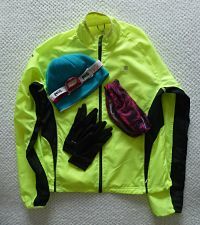 At night, wear reflective gear and better still, wear a bright yellow or orange top with reflective strips. I also wear a bright blue hat to avoid my head getting squished! Use a running light so that you can see where you are going and so that others can see you. There are all sorts of running lights, from headbands, chest bands and wrist bands. I wear a headband out of preference although it was trial and error to find one that didn't slip down my head. Running safely is not just about being seen. You need to also think about your own body and adapt to the weather conditions. Wear sunscreen on your face and exposed skin areas. Shield the sun off your face. I don't like caps as I get far too hot so I wear a visor which I can tie around my running belt when I don't want to wear it. Wear sweat wicking fabrics and light colors which reflect the suns rays better. Keep well hydrated by either taking water with you or plan stops where you know there is available water. I generally wear a water belt which is OK but it does tend to move around a bit so can be annoying. I also have a hand held bottle which fixes to my hand with Velcro which I prefer but it holds less water than the belt bottles. You can also get water backpacks which I am going to try this summer. Try and run in the shade if you can or run early morning or early evening when it is cooler. More tips for running in the heat. For me, the hardest part of winter is running in the the cold wind. I can put up with being wet but being wet and windy - no thanks! Wear layers so that you can take them on and off. However you don't want to be too hot so dress as though it is 20F warmer outside. Once you start running, you will quickly warm up. I like tops with zips so I can let air in or out easily. Hands and feet can get pretty cold so wear gloves or mittens especially if you suffer from Raynaud's syndrome and socks that are thicker than the usual summer ones. Wear a hat to keep your ears warm. I suffer from earache in the cold wind so wear either a woolly hat or a head bandeau. If it starts raining, you can choose to run for home or just carry on running. My philosophy is that once I am wet, I am wet! So I don't panic and often carry on running ( for a bit anyway). Just make sure you get into a warm shower and dry clothes once you get home. Running Safely - Where to Next?